I just had to take a little break from making toothpaste and body scrubs for this weekend’s holiday fair to tell you about this amazingly fun experience I had last night. As you may know, in addition to my love of herbs and natural body care, I love to remake things. Well, last night I got to play around with some tired old and moth-eaten clothes, remaking them into some fabulously fun frankensteined fashion (oh wow, who loves alliteration?). Down in DUMBO there’s this hidden little gem of a place known as Metamorfixx, home and studio of Petra Hanson, fashion designer, artist, musician, and now teacher. She gave me and 2 other friends lessons on how to take our worn out duds and make lovely new ones using various techniques. Two of my favorites were the sew-free t-shirt knot and on the opposite end of the spectrum, the super industrial Merrow serger. Petra shows us this cute tank dress she made using the knot technique. 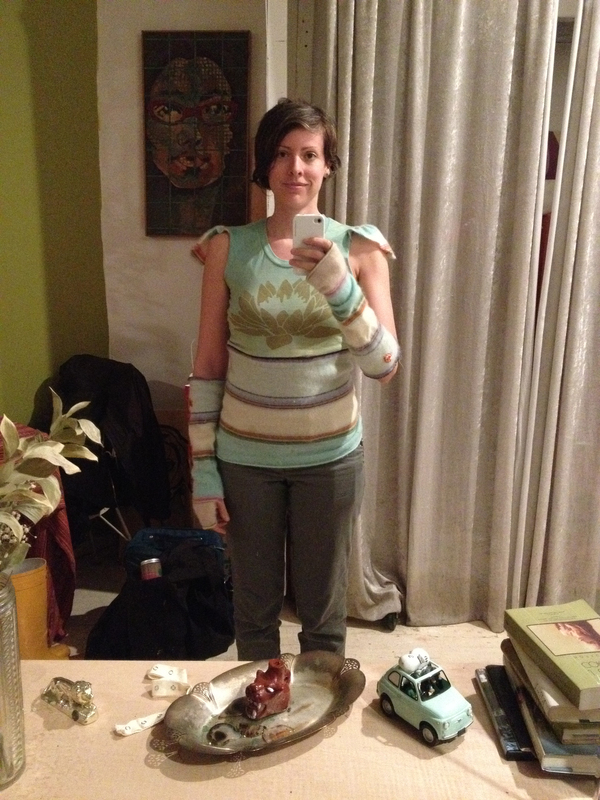 I took a t-shirt Livi got from a stoop sale and an old moth-eaten sweater to make this get-up I call Björkenstein. 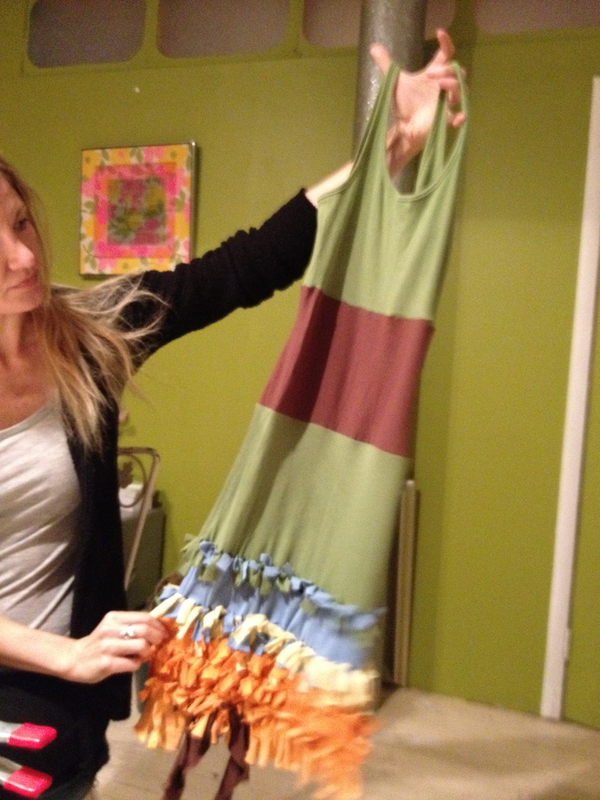 I found out about Metamorfixx from my dearest friend Livi (Olivia Cleans Green), after she went to an Evolver reskilling event where Petra demonstrated her fabric “fixxing” skills. 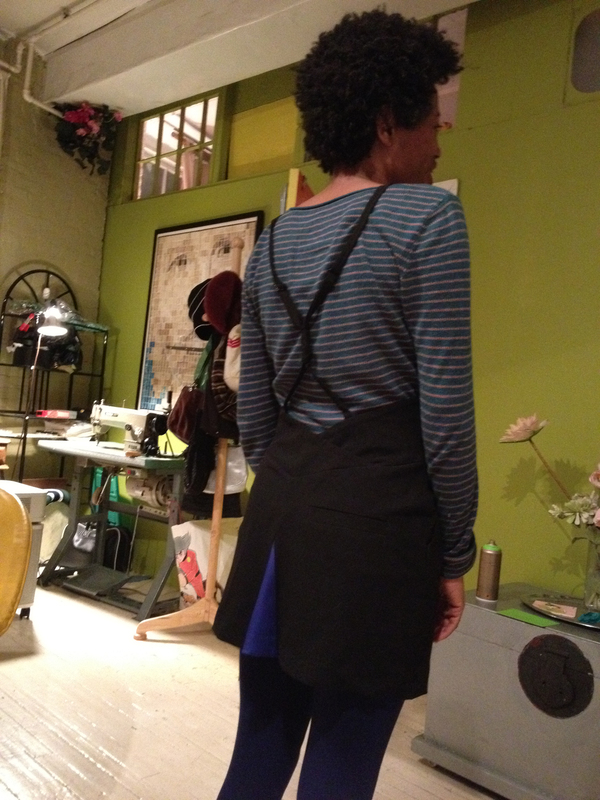 Livi doesn’t usually where trousers, but she loved the look of this tuxedo pants jumpsuit. 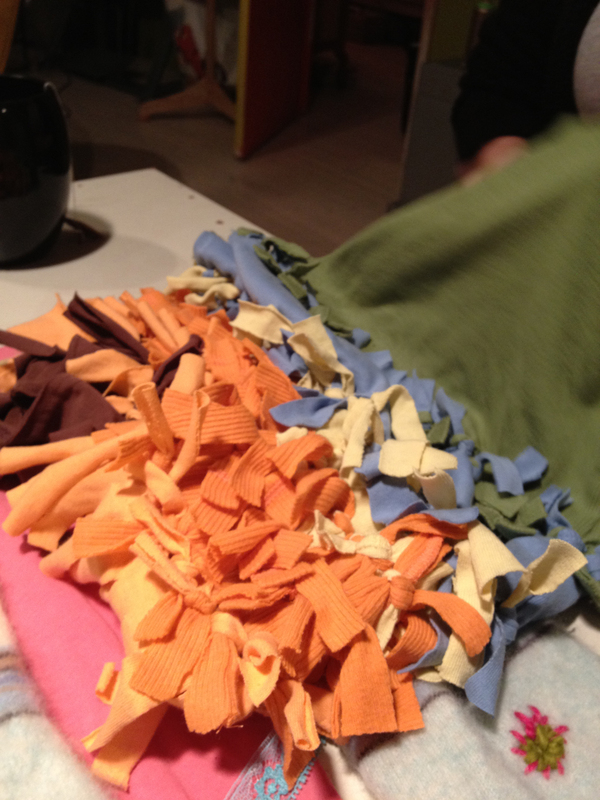 She fixxed it by cutting off the legs and inserting triangle-shaped fabric where the old inseams were. In the back, for added flare, Livi used some blue satin from a formal dress she’s had in her closet for many moons. So how can you get your fashion fixx? Get in touch with Petra. She’s now teaching small workshops like the one I attended last night. You bring the clothing and she supplies the notions and know-how. 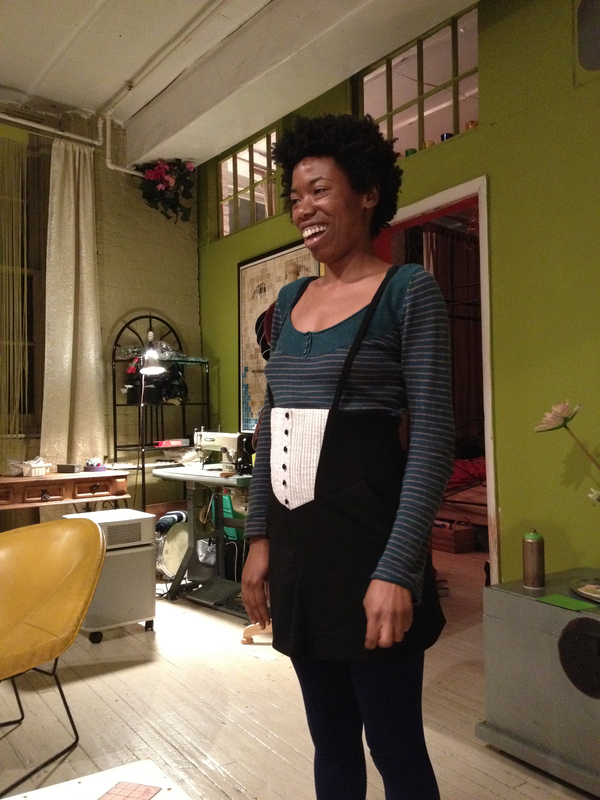 It’s *sew* much fun! (Yeah, I know I’m a dork). The secret word that is! The grand opening of Icebreaker of New Zealand’s first TouchLab store in New York City is Wednesday, December 1! And anyone who shops at the new Icebreaker store and says the Secret Password (“BAA BAA”) at check out will receive 10% off at checkout between now and January 1, 2011. The 2,500-square-foot SoHo store will be Icebreaker’s flagship, located at 102 Wooster Street (betwn Prince & Spring) across the street from Patagonia’s SoHo store (look out Patagonia!). You can also enter to win 1 of 50 pair of Icebreaker merino socks to people who help spread the word about Icebreaker’s first New York City store. See http://blog.icebreaker.com/2010/11/icebreaker-opens-new-york-city-store-in-soho. I can tell you from experience, these are some seriously awesome socks! What’s so great about Icebreaker’s merino wool goods? Natural and sustainably produced Icebreaker merino regulates body temperature in both hot and cold weather, is highly breathable to prevent the clamminess associated with synthetics, and protects the wearer from the sun’s harmful rays. It’s also “no stink” without washing, resisting odor for days – sometimes weeks – saving water and detergent versus stinky synthetic materials. Plus, the wool Icebreaker uses comes directly from the farm, so Icebreaker can ensure ethical sourcing and animal welfare. Icebreaker believes “nature is better than plastic.” I do, too. *As part of the grand opening, Icebreaker will give away a trip for two to New Zealand. Entrants must visit the store and try on an Icebreaker merino garment and complete the entry form. The prize includes airfare from New York, San Francisco or Los Angeles to New Zealand, one night accommodation on a merino sheep station (farm) in New Zealand, and an Icebreaker layering system for two. See the store for complete details. The brand is called PACT. All of their underwear, for women and men, are made with organically grown cotton. But that’s not all! They give 10% of all of their sales to a range of causes, including one of my faves, The Green Belt Movement. Oh yeah, and then there’s this. All of the packaging is either reusable or compostable (read: no plastic). Their goal is to provide a no landfill product that you’ll love. Learn more about PACT and get a pair or two for you or your loved ones! By now, we are all well aware of the tragedy that has struck Haiti. We know everyone is doing their best to help, and we would like to make donating as easy on you as possible. On Monday, Jan., 18, we encourage you to bring in any clothes that you would like to donate to the residents of Haiti. We will ensure that they get donated through “Fashion Delivers“. As a thank you for your participation, we will be serving cupcakes by Rabbit Mafia, and offering 10% OFF on any purchase that day. We will be operating at regular store hours and will open from 11:30 a.m. to 7:30 p.m. We look forward to seeing you on Monday. 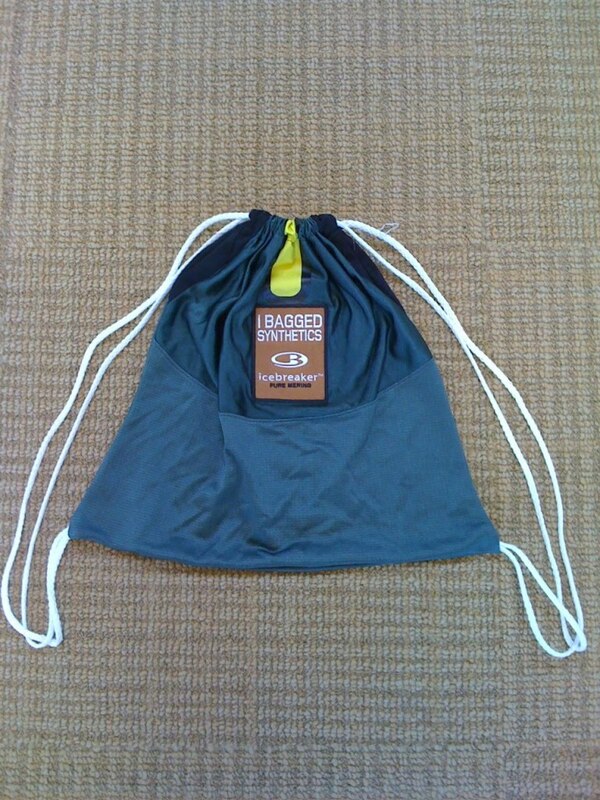 Icebreaker, maker of some of the finest Merino wool activewear around, will be “bagging synthetics” next week. Starting Monday, October 5, the New Zealand based company will be taking your stinky old synthetic, petroleum-based t-shirts (think polyester) and turning them into reusable marathon shoe bags in the Paragon Sports store window, on the spot, and for absolutely free. Bonus for marathoners and aspiring marathoners: get 26.2% off your Icebreaker GT purchase and get a free pair of Icebreaker socks (from Oct 5 to 12). 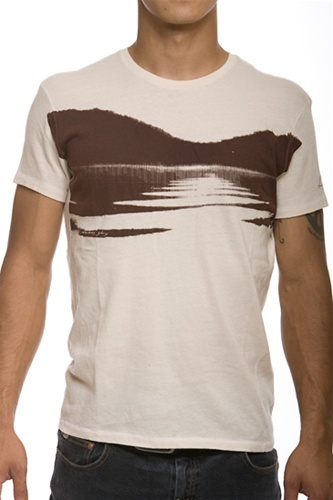 So why should you ditch your old synthetic tee for a Merino wool one? Plus you can run in Icebreaker apparel for weeks without washing it, so energy costs are reduced and less detergents are put into the environment. Read more about Icebreaker’s ethos. When I look at the tag inside a t-shirt to find out its origin, that “Made in Bangladesh” label is only telling a tiny part of the story. Sure, the shirt may have been sewn together in Bangladesh, but where was the cotton grown? Where was it spun, woven, and dyed? How many hands touched that one t-shirt in order to be sold in a retail shop in the US? 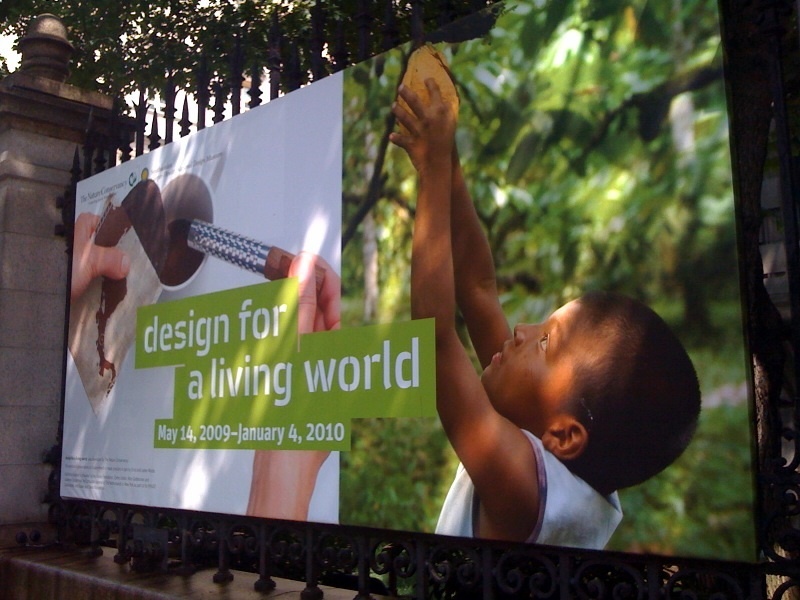 Design for a Living World, a fairly new exhibit at the Cooper-Hewitt Museum developed by The Nature Conservancy, removes the mystery of origin, at least in part, of some of the items we might encounter day to day. It shows us that natural is beautiful and knowing the source and inspiration of design is powerful. 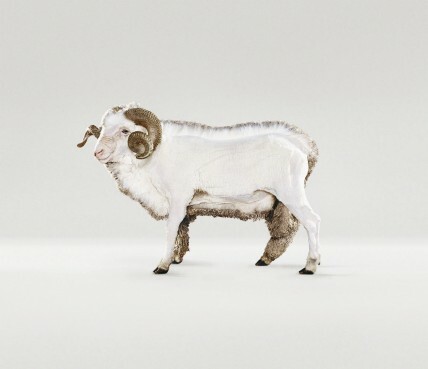 Take, for example, the organic sheep’s wool rug designed and knit by Dutch designer Christien Meindertsma. We see the sheep of Lava Lake Ranch in Hailey, Idaho, grazing on pasture. We see the raw materials, the just shorn wool, all balled-up and dirty with brush. And then each subsequent stage of preparation, from the cleaned wool, to the spun yarn, to the giant knitting needles, to the finished product. 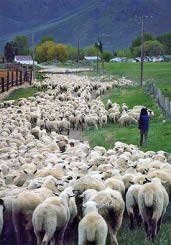 Many sheep, some farmers, and one woman. There’s no questioning the source, the process, the final product. Several other materials and products are displayed, showing the region of origin, a peek at the people who are stewards of that land, who harvest the materials, and a profile of the designer. 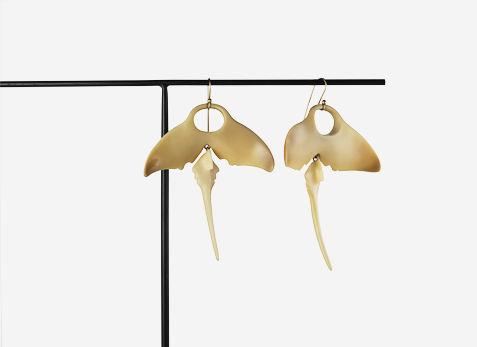 Alaskan salmon skin clothing from Isaac Mizrahi, FSC-certified red maple furniture from Maya Lin, and, my favorite, vegetable ivory jewelry of the Pohnpei ivory nut palm tree from Ted Muehling (manta ray earrings below). Surrounded by these beautifully executed designs, all as sustainably created as possible, I still left wanting more information. How do these products compare to their conventional counterparts? Considering how (relatively) few steps are required, how few hands touched these products, does that make them more or less accessible to the general public? Of course, the designs on display are not meant to be sold in stores, but how could they serve as models for those that are? I hope that I’m underestimating the impact this exhibit might have on a young designer, or a seasoned designer looking to turn over a new leaf. And I hope that designers like Isaac Mizrahi, who has churned out (not-so-sustainable) designs for Target, and now Liz Claiborne, will not just see this project as a one-off but as a guide for the goods they design in the years to come. Greenloop was recently named best online eco-boutique in Treehugger’s Best in Green Awards. Ekovaruhuset (aka, House of Organic), purveyor of premium organic fashion is having a huge sale next week. We are having a massive ONE WEEK SALE next week and we want to invite you to enjoy 50% off of nearly everything in the store. All Veja Sneakers, Bergmans shirts, Fin dresses, Kuyichi jeans, Pjux shoes, Katherine Hamnett Tees, Knowledge Cotton Apparel … just about EVERYTHING (excluding designer items) will be 50% off! Sale will last from Wednesday, June 3rd until Sunday, June 7th. Come quick to enjoy these amazing prices on our amazing organic goods! These days, I’m trying to focus on buying less, especially new things. But there are a few things I’ll buy new – underwear and Loomstate 100% organic cotton t-shirts. They might be the softest t-shirts I’ve ever owned. And in case you didn’t know, Greenloop recently won best online fashion shop from Treehugger’s Best of Green Contest.